Jemison took her first flight Saturday morning, then spent the weekend making occasional, short forays around the Times Square building. Yesterday she took her first extended flight, going about half a block before turning back and making a competent landing at the nest box. Callidora, much larger and heavier than her smaller sibling, did her share of flapping and wing practice, but couldn’t quite make the leap. That is, until this afternoon, when she too made her maiden flight. According to watchers on the ground, she tried to follow Jemison across a small gap at the top of the building, but ended up curving away from Times Square. She misjudged her return, bumping into the side of the building, but started flapping again and made a soft landing on the flat roof of the nearby Wilder Building, which is just across Exchange Street. She’s been sitting there for a few hours now, hopping along the rooftop. We’ve had Camera 1 trained on her all evening, and she looks no worse for wear. 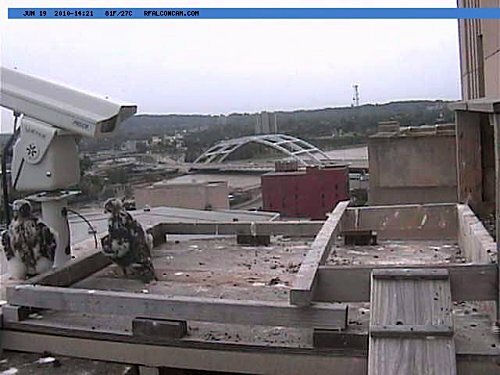 If Callidora doesn’t make it back to the nest box tonight, she’ll be perfectly safe on top of the Wilder building. Archer and Beauty know where she is, and it’ll be easy for them to feed her if she stays. Eventually she’ll make her way back to the nest box, and we have watchers on the ground just in case she takes a bad turn. Both of the fledglings have made pretty conventional flights. 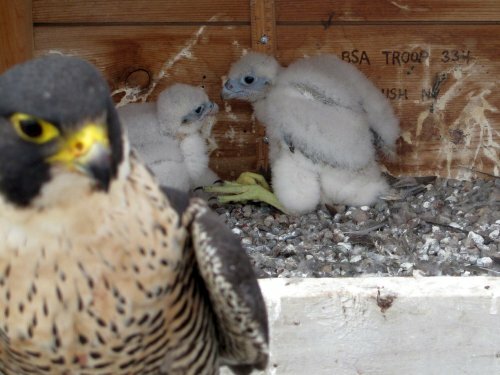 The watchers have a little adjusting to do, being in a downtown environment for the first time, but so far the Times Square building at the corner of Broad and Exchange Streets in downtown Rochester has turned out to be a pretty good place to raise young falcons. Other than a visit to Port Hope a few days ago, Quest has been spending all her time in the Tornoto area. In particular, it looks like she’s been hanging out at some high buildings near the Toronto Public Library, which overlook the Tam O’Shanter Golf Club. Maybe she’s working on her short game. When Quest isn’t looking for birdies on the links, she’s been out at the waterfront in nearby Pickering. It looks like there’s a large industrial complex that she’s been using as a base for her amphibious operations. So You Want To Be A Fledge Watcher? If you’ve been keeping up with the Rochester Falconcam, you already know that Callidora and Jemison have been busy exercising their wings and running around outside the nest box. They haven’t taken flight yet, but at the rate they’re going, those first flights could happen at any time. This year, even more than in the past, we’re going to need lots of eyes on these two falcons when they begin flying. We don’t have the luxury of big open spaces as we did at Kodak. In downtown Rochester there are plenty of buildings for the young falcons to land on, but those same buildings make it hard to keep the falcons in sight while they’re flying. The solution to that problem is to have plenty of people stationed near the Times Square building on street corners and bridges, so that we can keep them in view when they do decide to “take the plunge”. The Genesee Valley Audubon Society held an orientation meeting for fledge watchers last week, but if you didn’t make it to that meeting, you can still join the fledge watch. We’ve posted complete details over at our FalconWatch blog, but to make it easy you can just CLICK HERE to get started. Callidora and Jemison could really use your help, at least until they get used to their wings, and making decent landings. Those skills usually take one to two weeks to learn, but the organized Fledge Watch is scheduled for the next 3 weeks (it actually started last Monday, so we’re getting a late start!). So if you ever wanted to get out and see these marvels of nature in person, you couldn’t choose a better time than now. Come join the fun! Both Callidora and Jemison have learned that the world is a lot bigger than the few cubic feet of nest box they’ve called home since they hatched in May. In fact, it didn’t take them long to move from tentative hops in and out of the nest box to hanging out at the very edge of the platform on top of the Times Square Building. It’s a move that’s sure to have some of our live video stream watchers on the edge of their seats. If you haven’t taken a look at the live video recently, now’s a good time. We’ve added a second video stream from our very flexible Camera 1 so that you can follow the nestlings both in and out of the nest. There’s no need to worry about Callidora and Jemison wandering around. Out in the wild, falcons make their nests on the sides of tall mountain cliffs and other places where there aren’t any fences or walls to contain them. They’re naturally curious about their surroundings, but there’s little chance they’ll fall off the platform. The broad platform also makes a good place for the girls to exercise their wings. They’ll need to do a lot of that before they take their inaugural flights, so the more practice they get now, the better off they’ll be. We also have our volunteers out on the streets keeping an eye on things, just to be safe. 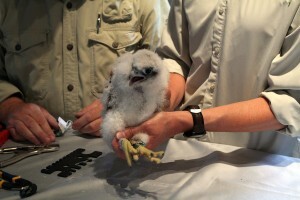 Speaking of that, the Genesee Valley Audubon Society held its annual Fledge Watch Orientation meeting this morning. Attendees were treated to a presentation on the history of Peregrine falcons in Rochester, along with all the information they’ll need to join the fledge watch, which should officially get under way in the next few days. If you missed the presentation, but still want to get involved, don’t worry. 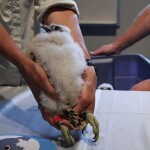 We’ll post instructions on how you can join the Rochester Falconcam Fledge Watch soon! After what turned out to be just a day trip to the Port Colborne nest site, Quest went back to her familiar territory in and around Port Hope. She stayed there a couple of days, then decided to go on a sightseeing tour around Toronto. Besides getting into the city itself, it looks like she was also checking out Pickering and Mississauga, Ontario. The heat doesn’t seem to have bothered her much, if at all. She’s moving right along, showing no signs of settling down. It didn’t take Callidora too long to figure out that only a short hop would take her outside. The nest box rests on a broad plywood platform that’s about 5 feet (1.5m) long and 3 feet (1m) wide, so there’s plenty of room to walk around. It’s also a good spot to get in some flapping practice. If you’ve been watching our live video feed (now featuring two cameras! ), you’ll have seen that both Callidora and little sister Jemison have been flapping their wings more and more. They’ll need to build the flight muscles in their chests before they take those first flights. That’s still a couple of weeks away, though. In the meantime, watch for their white fluffy down feathers to disappear over the next several days as their juvenile feathers continue growing in at a quick clip. And keep an eye out to see if Jemison decides to join Callidora outside! 2010 was another banner year at the Rochester Falconcam as our two Peregrine nestlings received their ID bands from the DEC and, even better, got their names! More on that a little later. It also marked the first time that we’ve been able to broadcast the banding live, on the Rochester Falconcam’s Streaming Video page. It looked like it might rain today, but we had good weather for the banding. Our intended start time of 10AM slipped a little, but that didn’t stop crowds of local falcon fans, television and print media, school children and even some passers-by from turning their eyes to the sky in anticipation of all the banding day action. Archer and Beauty put on a spirited defense of the nest box. Beauty wasn’t as aggressive as Mariah. She and Archer stayed 15-20 feet (4-6 meters) away. This being her first year of motherhood, we expect that she won’t give us the same latitude in the future. Both she and Archer contributed equally to defending their young, with plenty of kacking and fly-bys from each. In fact, Archer showed a bit of his grandmother’s fierceness, coming closer to the banders than Kaver typically would. It will be interesting to see if these two learn to be more aggressive as time goes on. Mike Allen took time out of his retirement to do the banding duties. As usual, he was accompanied by Barbara Loucks, the head of the DEC’s Endangered Species Unit. 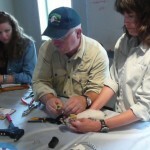 Also in attendance this year was Jenny Landry, a DEC Wildlife Technician attending her first Peregrine banding. Of the work extracting the eyases from the nest box, Mike said, “It couldn’t have gone any better.” Both eyases were sitting calmly when the trap door on the right side of the nest box was opened, and were easily transferred to a small tote for the quick trip inside the Times Square building. Mary Jemison was called “the White Woman of the Genesee.” Kidnapped in Pennsylvania by the Shawnee and French in 1755 at an early age, she was given to the Seneca. Later married to a Delaware brave. She traveled with her baby son, on foot, more than 700 miles to the Genesee river valley. She lived with the Seneca for the rest of her life, gaining respect as as advocate of her adopted nation. Up next was the bigger of the two eyases. The consensus in the forums was that this one was definitely a girl, and even the DEC folks remarked about how big she was. She got her health check, and other than a few avian lice, she was found to be in excellent condition. Her ID band is black over green, 96/W. Her USFWS band number is 1687-01353, covered with red tape. The name comes from two Greek words, “Kallos” (’beauty’) and Doron (’gift’). Thus, the name means “Gift of Beauty”. The class thought that was quite fitting since Beauty is their mother’s name. We agree, Callidora is an excellent name! Putting the eyases back went as smoothly as getting them out. Archer and Beauty put on another mad flying display, circling and crying, while members of the Rochester Falconcam guarded the backs of the DEC officials as they worked. In short order the eyases were back in the nest box and everyone retreated inside. Another Banding Day success! A great deal of work went on behind the scenes so that we could bring the banding event to everyone, and here at Imprints we want to acknowledge the contributions of all those who made today’s event possible. First, we want to extend our heartfelt appreciation to Rich Calabrese and all the folks at the Times Square building who gave us the opportunity to erect the nest box. Without their enthusiasm and cooperation we might not have any falcons to enjoy in Rochester. We also need to thank our friends at the DEC, especially Barb Loucks, Mike Allen and the newest banding team member, Jenny Landry. Their constant dedication to the health of the Peregrines here in Rochester and throughout New York state is nothing short of amazing. Extra thanks to them too, for their foresight in deciding to place the nest box on Times Square. Today’s banding event was hosted in the 11th floor offices of Epostmarks. Jason, Janet, and all the folks at Epostmarks not only provided a wonderful venue for the banding, but they generously allow the Rochester Falconcam to be transmitted over their company network, saving us serious cash that we’d otherwise have to spend on Internet access. We’re grateful for their many contributions and support. Finally, the work of many members of the Rochester Falconcam team went into the banding. June Summers handled the emcee duties. Fal-Kenn Martinez and “Shaky” worked their technical magic to stream the banding live. Jeanne, Aafke, Donna and Ei provided online updates in the Forums. Carol Phillips took still photos from inside that were uploaded to the website, and Jim Pisello grabbed photos and video from the event and coordinated with the media. It was truly a team effort on everyone’s part. Did you miss the banding? Don’t worry! You can watch the video recap HERE. We’ll also be putting together a photo album, so look for that soon! In case you haven’t heard the news yet, our two eyases will be banded tomorrow morning by wildlife officials from the New York State Dept. of Environmental Conservation. Here are a few things you should know. The banding event will begin around 10:00 AM Rochester time. It shouldn’t take more than an hour to conclude. Local fans and birders are invited to gather at the corner of Broad and Exchange Streets in the city. From there you should have a front row seat for all of the flying we anticipate from Archer and Beauty as they defend their nest box and eyases during the banding process. Unfortunately, you won’t be able to see the actual banding of the eyases from the street, and due to space considerations and other factors, the number of people who will be present at the banding will be limited to only a few invited guests. Therefore you may want to consider Option B.
What’s Option B? Why, it’s to watch the banding LIVE from the comfort of your home, office or wherever you have a computer and an Internet connection. We’ll be broadcasting a live video stream during the banding event. Here are a few things you should know. The official source of information during banding will be the Rfalconcam Now board. Look for a Banding Day 2010 topic to appear around 10 AM EDT (Rochester time). One of our Forum moderators will post comments to the Banding Day 2010 topic throughout the process. To make the commentary easier to follow, you will not be able to post to the Rfalconcam Now board during this time. However, feel free to post to the other boards and chat areas. Be sure to refresh the Rfalconcam Now page every few minutes to see new posts. Twitter users will also be able to receive the latest information by following RfalconcamNow. We hope you’ll join us tomorrow for another exciting banding day event! The Rochester Falconcam team has been hard at work with our partners at the New York State Dept. of Environmental Conservation on plans for Banding Day. Most of the i’s have been dotted and the t’s crossed, so we’re ready to announce that we’ll be banding Beauty and Archer’s two eyases on Thursday, June 10. Banding activity should begin around 10AM, and we plan to conclude about an hour later. Since this is a new pair at a new nest site, there are a lot of unknowns this year. As a result, we have agreed with the DEC to make the banding a low-key affair, so on-site participation will be limited to a few invited guests. But don’t worry because we’re going to broadcast the banding event on our live video stream! This will give all our viewers around the world a chance to witness the banding as it happens– something that we’ve never been able to do before. Along with the live video feed, we’ll be recording video for later broadcast on the Rochester Falconcam YouTube channel. We also plan to have a member of the Falconcam team providing online updates. We’re still working on the exact details of how that will work, but we’ll post more details once we get them worked out. Of course, one of the most popular parts of the Banding Day activity is the naming of the eyases. This year we have invited two groups to submit names for the eyases. You’ll learn more about who they are and the names they chose when we announce them on Banding Day. If you’re in town you might want to come down to the corner of Broad and Exchange Streets on Thursday morning. Usually the adult falcons put on quite a flying show as they wheel and dive in defense of their nest and the eyases. We’re not sure how Beauty and Archer will behave, but there’s a good chance you’ll get to see some fantastic flying. The local print, radio and TV media have also been invited to watch from outside, so if you come down you may get to have your very own “fifteen minutes of fame”. So get out your calendars and mark the date. We’re looking forward to another terrific Banding Day, and we hope you’ll be able to join us. From falcon watcher/photographers Chad and Chris over at the Cleveland Museum of Natural History’s Falconcam site comes this wonderful picture of Seneca posed with her eyas, which has been unofficially named “Warrior”. 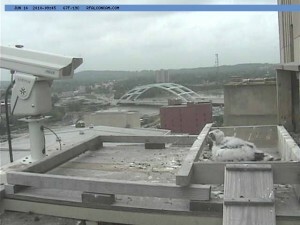 Two eggs hatched at Seneca’s improvised nest site under the Brookpark Road Bridge, but the second eyas did not survive. Seneca and her mate Cheyenne have been doing a fine job of providing for their young nestling. You can see a marvelous example of an aerial food exchange between Cheyenne and Seneca, also photographed by Chad and Chris, on the CMNH Falconcam Forum. It seems like Quest may be taking a break from her constant traverse of Lake Ontario’s north shore. A majority of her location readings have placed her in or near Wesleyville, Ontario. As with last summer, she’s been making her base of operations at the power station there. She spent much of last summer near this power plant, so time will tell whether she stays or decides to strike out again. 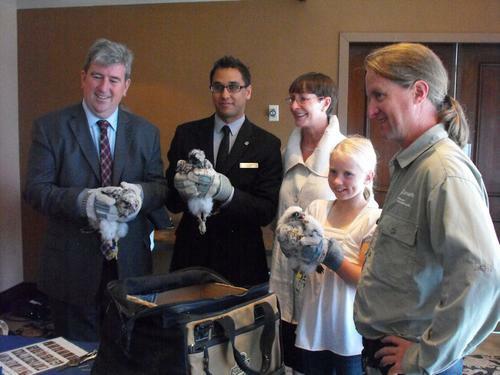 Rhea Mae’s three eyases were banded last week at the Sheraton Centre hotel in downtown Toronto. It turned out that all three were tiercels, or male falcons. The three were named Scribe-Star, Legacy & Lorenzo (pictured left to right, above). Several Rochester Falconcam fans and team members attended the banding, and they even provided the name for Legacy. Click the picture above for more photos and a video of the banding, courtesy of “Big Frank” Buston and our friends at the Canadian Peregrine Foundation. You are currently browsing the Imprints blog archives for June, 2010. 1 – Welcome to Imprints! 5 – Banding Day 2007! 6 – Banding Day 2008!